Firewood Types：Which Firewood Types Should you Use? Which Firewood Types Should you Use? How to make delicious homemade Churros. Best Camping songs for a great Experience. A new experience in outdoor cooking, light weight camping and out of the world Recipes. When one sees this topic you may think it is strange speaking of an obvious thing like outdoor camping and backpacking. One may think just like dining with your family and friends it does not need any prior knowledge about it other than packing the supplies and going out for an experience of your lifetime. But do you really know what camping entails? What kind of preparation needs to go into this? When to go and some of the nitty gritty towards it? Let me take you through what’s and whatnots of the whole process. Let us discuss some outdoor camping guidelines for you to truly know outdoor camping and backpacking. First of all, what is camping? The definition of camping is an outdoor activity involving overnight stays away from home in a shelter, such as a tent, a caravan, or a motorhome. Generally, participants leave developed areas to spend time outdoors in more natural places in pursuit of activities providing them enjoyment. Let’s go down the memory lane and talk about the history of camping. When we mention camping we often remember Thomas Hiram Holding, a British traveling tailor.People always used boats or crafts to transport early camping equipment which was very heavy. Although Thomas Hiram Holding is often seen as the father of modern camping in the UK, he was responsible for popularizing a different type of camping in the early twentieth century. He spent a lot of time with his parents traveling across the American prairies when he was young, so he experienced the activity in the wild from his youth. He wrote The Campers Handbook in 1908 so that he could share his enthusiasm for the great outdoors with the world. In the US, camping may be traced to William Henry Harrison Murray 1869 publication of Camp-Life in the Adirondacks resulting in a flood of visitors to the Adirondacks that summer.In 1932, the International Federation of Camping Clubs was founded. By the 1960s camping had become an established family holiday standard and today campsites are ubiquitous across Europe and North America. 1 The Best Time for Outdoor Camping and Backpacking. 5 Kinds Of Medicines And Drugs For Outdoor Camping And Backpacking. 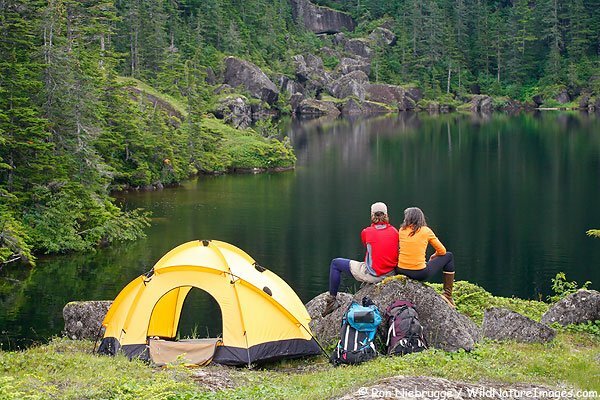 The Best Time for Outdoor Camping and Backpacking. The best time for outdoor camping is in the fall. It is different from the summer which is hot or the winter which is cold. Chilly mornings, perfect hiking and warm comfort food all come together to make fall camping a must-do for any outdoors enthusiast. 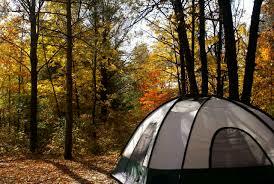 If you don’t believe that, here are some reasons for you to bring your tent for a fall camping. The Scenery: It is a picturesque time to go camping in the fall because during the fall season, in almost all areas of the country beautiful colors reign supreme. The Scenery in Autumn is always beautiful with the fallen leaves and slightly cooler temperatures. The Weather: The steam of coffee or hot chocolate is rising into the fresh morning air, and they are never tasted as good as on a crisp autumn morning. The weather is neither hot nor cold and therefore quite comfortable to have an outdoor activity. Affordable Rates: Fall is the best time to get the most affordable rates with peak season behind you. Fewer Bugs: Chilly fall temperatures can make forested campsites more comfortable, instead of the flood of mosquitoes and nagging insects. A Good Night’s Sleep: Sleeping is more comfortable on cool fall nights instead of the summer months which can make your hot tent even more unbearable. What’s more, it is restful to look at the stars when you are sleeping under them. Different Activities: AccessCamping reports, “Autumn used to be a quiet, slow period in the country’s parks, but things have changed, notes Paul Bambei, president, and CEO of ARVC. He says that although fewer campers are traveling, park operators have discovered they can sometimes fill their campsites and cabins to capacity if they provide enough activities.” When you go camping in the fall, there are a lot of different camp activities to try: Apple picking, Pumpkin picking and carving, Local harvest festivals like Oktoberfest, Halloween events and Fall fishing derbies. Fewer Crowds: Although you will meet new people when you go camping, busy campgrounds can be overwhelming. During the school year, you can enjoy having fewer neighbors and less crowded hiking trails. You must be interested in going on a camping adventure, so whether you would like to go camping alone, with a group of your friends, with your family, or with your romantic partner, the most things you need to prepare are multiple pieces of camping equipment. In case that you would forget something you need when you are on camping, creating a camping checklist for yourself will bring a number of benefits. First, if you will go camping by yourself, creating an adventure checklist will bring the biggest benefit is that you are less likely to forget to bring important pieces of equipment like a Chaetae Chair or other needed camping or beach supplies. Many people often wish to bring something, but when they are preparing the packing the day before camping, they must forget something they want to take. Write down all the things that you want to bring, and before writing down, you can think of as more items cross your mind. Second, for family, you must make sure there is enough to do to entertain the whole family—it can overwhelm. There are a lot of hard work to do, but it’s worth it after a great camping. Making lasting family memories, enjoying lots of laughs with the family, and getting plenty of outdoor time for the kids are all the benefited things you can get from a wonderful camping, even though there is a lot of hard work to do. Here are three basic aspects. 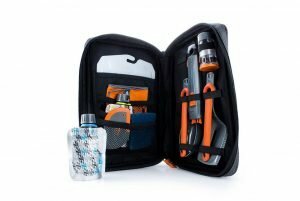 It contains a collapsible whisk, pivot spoon, pivot spatula, utility knife, spice shaker, 2 condiment containers, cutting board, scrubber, scraper, camp towel and a ballistic cloth case, which is ideal for cooking larger meals on the trail. All these tools are placed in an exquisitely organized case and the entire set weighs in at just over a pound. 4.8 ounces is the entire weights of this modular set. 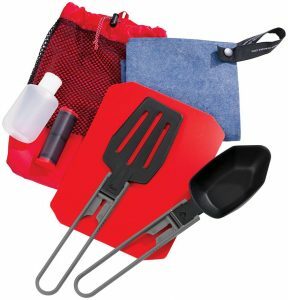 Folding spoon, spatula, ultralight cutting board, salt and pepper shaker, squeeze bottle and dish can equip you to chop, flip, serve and clean up. 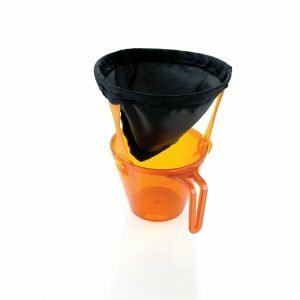 You will have no more excuses that the coffee machine is too heavy to bring, this outdoors ultralight java drip coffee maker can make enjoy outdoor coffee easier. It is the good news for backpackers who pride themselves on traveling the lightest. It weighs less than half an ounce which can produce bold and sediment-free coffee in nearly any mugs. It weighs 2.5 lbs but can support 44 lbs. 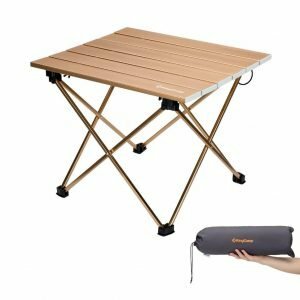 Unlike wooden or nylon-top tables, this aluminum table is waterproof, harsh weather-resistant, and easy to wipe clean, which can set it up and fold in seconds. Use the carry bag, you can carry it everywhere. When it is folded, it is small enough to be packed and suitable for all types of outdoor activities. 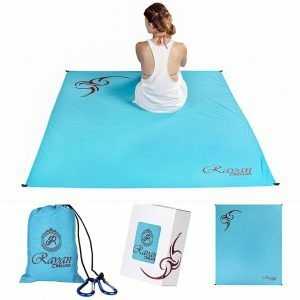 When you are outdoors for camping, you can not just sit on the ground or the sand, so here you need a must-have equipment for everyone that loves outdoor activities, the blanket. No matter what you are doing, hiking, running, swimming, cycling or climbing, all these activities need a blanket which is both water resistant and sand proof. You can pack this 70 x 56 inches blanket which is 0.5 lbs in one specially designed box. 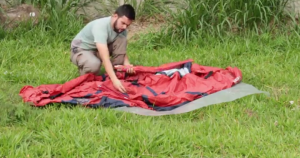 Lay a tarp down before putting up your tent. In order to protect your tent from gathering moisture, when you are setting it, make sure that putting a barrier in between the ground and the bottom of your tent. 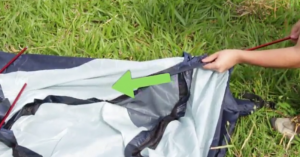 In case that any part of the tarp hanged out beyond the edge of the tent, you need to fold the tarp into the relative shape of the tent. Layout and account for all the components of your tent. At first, you need take all things out and just take the tent itself and the poles left. Lay your tent on the tarp. Put the bottom side of the tent down on the tarp. Set the windows and door of the tent in the direction you would like them to face. Pay your attention to the poles and lay it out. Your tent may be connected with bungee ropes, or they may be numbered and require that you connect them yourself, because different tent has different size. Put the tent poles together and lay them across the flat tent. Insert tent poles into the corresponding flaps in the tent. Because all tents are differently designed, the first thing you need to do is reading the directions of your particular tent. 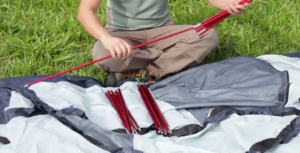 Make two tent poles cross each other to form an X that will form the basic frame of the tent. 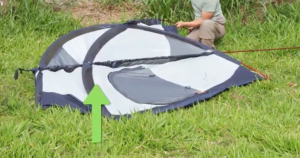 Putting the end of the pole into an eyelet at each corner, and sliding the pole either through small flaps on the top of the tent, or attaching plastic clips on the top of the tent to the pole so that you can fit the poles into the tent. After fitting both poles through their connection spots, then straightening up and raising the tent into what looks basically like something you could sleep in. So if you have a partner for this part, it will be easier to do this. Stake the tent to the ground. 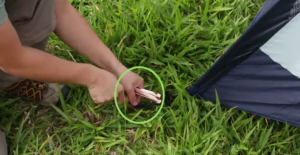 Use the metal tent stakes to fit through the flaps near the ground at the corners and push them into the ground after the tent is square on the tarp. Some tent stakes are pretty easy to bend, so when you use a tiny hammer or other blunt objects to hammer the metal tent stakes in the hard ground (like a rock) a little, you must be careful to do this. 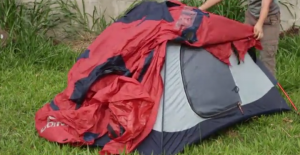 The extra rain guard is called a rain fly which is basically another sheet of material that covers the tent. During the night your tent maybe a little bit cold. Here are some ways you can warm up your tent. Kinds Of Medicines And Drugs For Outdoor Camping And Backpacking. When you are going camping, it is inevitable that you will be in trouble with some illness. Especially, when you are camping in the fall, the weather will cause the cold. So one of the most necessary things that you need to bring is the medicine. Here are some examples of medicines and drugs that you should not forget when you go out camping next time. When you are going camping with your family, you must do not want the bugs especially the mosquito to annoy you. When you are lying on the grassland, watching the stars with your family, then you will take a deep breath and close your eyes, enjoying the wonderful time out of working and stress, at this moment, the mosquito is flying around your ears, your good mood must be destroyed by their annoying sound. So at this time, what you truly need is something useful that can help you get away from the annoying mosquito. Here come the mosquito repellents. You can get the machine of repellents from the internet, or you can try some medicines or drugs which can be gotten in the drug shop. By the way, you also can use some natural repellents like Citronella Oil, Lemon Eucalyptus Oil, Cinnamon Oil, Castor Oil, Rosemary Oil, Lemongrass Oil, Cedar Oil, Peppermint Oil, Clove Oil, Geranium Oil. When you are camping, what you need most is the drinking water. We can never live without water. But, when you are camping outside, you may not bring a lot of water with you in order to get rid of the high weight of your backpack, and the water outside is not clean enough for humans to drink, so you need chlorine for the water.You can get the chlorine from the internet or your local drugs shop. Liquid chlorine should be stored away from sunlight. When you are camping outside with your family, the No.1 sentence you do not want to hear is “it’s boring”, especially from the mouths of your kids. So how to make them happy during camping outside? Here are some interesting games for kids to keep their passion. The great outdoors is the best place to hold a scavenger hunt. Have players collect items, and each player should stick with an assigned buddy or small group. As you can find a different variety of items ranging from leaves to acorns, the fall is the best season for this game. If you want to spend time together with a lot of laughs, Camping Olympics must be the best option for you and your kids to have fun. You can hold team competitions or individual games depending on the number of campers. Besides, you can prepare some prizes for every kid, no matter who wins or loses. The bean bag toss, for example, you can tell the kids what the prizes for the winning team, runner-up, and the third place. In this way, kids will keep their eyes on the price and can release their whole passion for the games. Telling some interesting stories to kids under the stars in the night before going to bed. But if you have no idea to make up tales, digging up your family folklore or share anecdotes about your kids when they were babies or toddlers. You can also play a game with your kids, one person says a sentence and the next person continues it, which will bring a lot of fun around the campfire. Find a shady spot and spread out a blanket, lying down with your kids and stare up at the sky, let your kids try to find an apple, bear, cat or the shape of states of U.S.A. to let your kids learn the alphabet and the map in such an interesting way. You will have an art journal of your trip with your kids if you bring a micro-kit of glue, scissors, markers and paper, and a pad of paper for each child. Let your kids pick the picture they see or they imagine to draw. You may have a great fun on the sunny day when you are camping, but how about the rainy day? You will be stuck in your tent, no wonder your kids will say that is boring. So never staying in the tent when it’s raining, you should get out and embrace the rain. Bring extra socks and a change of footwear with you, and you will be surprised at how much fun can be had outside on a rainy day, go to explore and enjoy the rain with your kids. Campfire Stories – Creepy Stories to Tell After Dark! More Around the Fire Games for Kids. When you are camping with your friends, you will just grill and drink beer, or sing some songs and tell something from the bottom of heart to each other. If you are still doing these basic activities when you are camping today, here are some interesting activities for adults like you. This game can test people’s ability to act and observe, which is not complicated for you, all you need to prepare are a pen and some paper. Firstly, you need write a killer on one paper and mix it with each other paper casually. If a person picks a card with the killer can kill one people who round by means of knock out, then the survivors should try to pick the murderer out of the crowd. The point of this game is the skill of speaking and lecture. It is a traditional game from ancient Rome which is called “Quoits” at that time. The soldiers throw the arrows in the arrow box which is in the center of the ground. Nowadays, you can pick some stones in similar size, place a bucket in the middle of the ground, make the same distance for everyone who particular in the game. Mark the scores and the last player will be punished. A little and easy game for you to test your intelligence, sitting around the campfire in a circle, the first person says ONE FROG, the second says: TWO EYES, the third says: FOUR LEGS, the fourth says: IN THE PUDDLE, the fifth says: KER-PLOP. See how many frogs you can count without mistakes, if someone who pause, he or she will be punished. There is no winner in this game, you can get the fun from the process of transporting the message and compare the final to the original. How to play: the first person whispers a sentence to the next person in line, and the second person passes the message to the next, and to the next until the last person who will speak the message loudly. This game is very simple but can make your campsite full of laughter and happiness. Choose two persons, standing face to face, now try to make people laugh while preventing yourself from laughing, the person who laughs first is the loser, and he will be punished, for example, by drinking a cup of vodka or a lot of water. If you want more challenge in this game, you can drink some water but don’t swallow, just keep the water in your mouth, then play this interesting game, in this way, you will get more laughter and happiness with your friends. Every camping lovers want to have the best experience of a good camping, so when you are going camping in the fall, you must want to have a good sleep in the cool night, you mustn’t want to wake up in the midnight because of the cold weather. When you go camping in the summer day, you need to get rid of the mosquito and other bugs. When you go camping in the golden fall, you need to get rid of the cold weather. Even in the tent, you will feel the cold ground if you don’t know how to warm your tent. It’s not just freezing, but very uncomfortable, so here are some easy ways on how to warm your tent in my opinion. 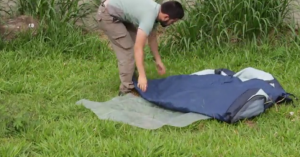 A high-quality sleeping bag is the first thing that you need for a good and warm sleep. You can also bring a sleeping pad with you to plus your experience of warm sleep in the cold night. Use some heat machines in your tent to make you warm, such as a Catalytic Heater. Use some heat machines that can make a little noise in your tent, plus, it won’t make the tent stuffy. Something strange like a heat blanket, all you have to do is to connect the thermal blanket to your tent’s ceiling using a duct tape. Then, you can have a good night’s sleep. If you want to experience more fun, a wood burning stove which has no gas is your best choice. But what you need to pay attention to is that you must learn some safety guidelines for the equipment before it is on fire. Compared with a little heat machine, it can provide enough heat in the cold night. 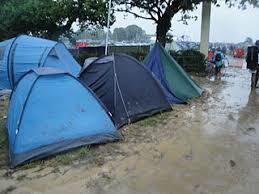 Now you need to care about the ground of your tent, you may not want to have a warm tent except the ground. So what you need here is an underfloor heater. A knit hat is also a good idea for having a good sleep on a cold night. When your head is warm, your body will be warm too. You need to put your socks on, even though you have the heat machine to help you get warm. But the socks must be dry if you don’t want to end up wetting the tent. So if you want to have a great experience that you will never forget, you need to ensure that you make your tent warm enough with those tips I write above. No matter how warm your clothes are, it will never work better than a heat machine, so a good heat machine will help you get away from the cold night and have a nice dream. Charcoal Chimney for larger tents. What you are going to eat for breakfast depends on how much physical activity you have planned for each day. The best option for a great morning is using a camp stove to prepare baggies full of rolled oats with dried fruit or honey to sweeten them rather than the sugar. Oats and nuts are both great sources of fiber, and serving with whole wheat pancakes or a veggie omelet made with powdered eggs will be a healthy option for breakfast. The whole grains, such as whole grain pita bread or wraps, which pack easily, are a good source of fiber, it can help you keep your energy for a longer time than white bread. What’s more, the food without heat is also a great idea for camping outdoor, in this way, you can stay on schedule to get to the next campsite or scale the next rock face. At this time, you will have enough time to pull out the cooking equipment, start an open fire, and explore some serious flavor profiles, because this is the most important time for family time to enjoy dinner together. Try beans, corn, brown rice, and salsa with Mexican spices in whole grain tortillas for Tex-Mex night. Or use whole wheat pita bread to make easy pizzas — just add sauce, cheese, and veggie toppings and toast it in a pan over a cook stove until the bread is somewhat crispy and the cheese has melted. When you are hiking or swimming during the day, you may feel hungry at such an awkward time, between two meals. So certain fruits and veggies, such as apples, carrots, and celery sticks, will last a few days in a pack and are great for snacking. See, having a healthy camping is not a difficult thing after all. More people would also prefer to carry some home processed foods. Check out some home processed foods. When you are trapped under debris, use a cloth or shirt to cover your mouth while making some noise by tapping any objects that can be near you. Avoid places with erected objects or trees. Move your family to a plain space away from rocks which might be shaken and fall on the people nearby. If you are in the open or in your car outside when the tornado is approaching, find a shelter indoors immediately and cover your head with your hands. Try to avoid higher places and places with erected objects too. Move to a higher ground immediately when the flood is coming. Do not gather belongings. Do not stay in moving waters, which might have either object that might hurt you or the currents of the moving water will sweep you away. In case of emergency occurrence of a hurricane, assess the situation and move away from the places with strong lightning and thunderstorms. Move away from erected objects and get to a near place with a lot of people to allow rescue operation easier in case there is some help. If your tent is on fire when you are camping, do not use the water, but find some sand to put it off. If you are in the tent, don’t be panic, get out immediately with a cloth or just your hands to cover your mouth. If you can not find a way out, use a knife to cut your tent to live.So when you are planning to go camping, make sure that you choose a clear date with no indications of some natural disaster to happen. Most backpackers go backpacking to connect with their inner self and to have alone time. Most of them will, therefore, assume some disaster preparedness measures.Before anything happens, you should find reliable information sources, warning systems, and alert systems in advance, family communication is also a point of surviving. First of all, the insurance. You say that you have much insurance, but this is different. Insurance is meant to pay for your healthcare or loss of some few property during a disaster. Second, learning. Before camping, learn some skills to survive in the disaster. Such as, how to get to a safe place, how to contact each other, how to get back together and what you will do in a different situation. Third, put your emergency card in your wallet so that you can carry it with you to go anywhere. In case that you were hurt in a disaster, when people find you they can use this card to find your family to look after you. Finally, prepare enough food and water for a disaster. When the disaster is coming, you can not get out to the supermarket to buy the food to eat and water to drink, so at this condition, enough food is the point for you to survive when you are trapped in your house or somewhere that you can shelter. The last but not the least, you must be calm when the disaster is coming, do not be afraid of what will happen. Being calm is the first point for you to survive. I hope that you can enjoy your outdoor camping and backpacking next time, and I hope that what I said above can help you, even a little. Freethinker and Social Media Enthusiast. The Main Author Olivia Moore is a cooking and recipe lover, cast iron enthusiast and the brain behind the website outdoorfeeds which brings together lovers of cooking, camping and cast iron cooking to share recipes,experiences and advice. Arlen on Firewood Types：Which Firewood Types Should you Use?